This article is about the American magazine. For the British men's magazine, see Parade (British magazine). For other uses, see Parade (disambiguation). Parade is an American nationwide Sunday newspaper magazine, distributed in more than 700 newspapers in the United States. It was founded in 1941 and is owned by Athlon Media Group, which purchased it from Advance Publications. 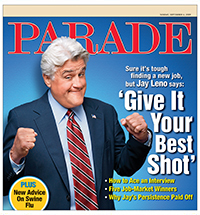 The most widely read magazine in the U.S., Parade has a circulation of 32 million and a readership of 54.1 million. [update]As of 2015, its editor is Anne Krueger. Parade is printed on newsprint, although usually a higher quality of newsprint than the rest of the newspapers it accompanies but of lesser quality than magazine paper. The magazine has one main feature article, often a smaller feature article, and a number of regular columns. There is also a significant amount of advertising for consumer products, some with clipable coupons or tear-off business reply cards. The magazine was started by Marshall Field III in 1941 as a weekly magazine supplement for his own paper (the Chicago Sun) and for others in the United States. By 1946, Parade had achieved a circulation of 3.5 million. John Hay Whitney, publisher of the New York Herald Tribune, bought Parade in 1958. Booth Newspapers purchased it in 1973. Booth was purchased by Advance Publications in 1976, and Parade became a separate operating unit within Advance. Parade Digital Partners is a distribution network that includes the web site Parade.com and over 700 of the magazine's partner newspaper web sites. Parade Digital Partners has a reach of more than 30 million monthly unique visitors (comScore Q1 2014). Throughout 2016, Gannett Company, which had produced USA Weekend, the most direct competitor to Parade until its December 2014 discontinuation, added (or in most cases, re-added) Parade to many of its Sunday newspapers as a replacement. "Ask Marilyn" by Marilyn vos Savant: Vos Savant answers questions from readers, from brainteasers to explanations of illogical customs, advice, or legitimate philosophical questions. Occasionally she will pose a brainteaser of her own or poll her readers. Cartoon Parade: Panel cartoons by various creators, including Dave Coverly, Carla Ventresca, Dan Piraro, and Gary McCoy. By 2016, due to the expense and lack of interest, these had been dropped. "In Step With" by James Brady: Celebrity interview column which ceased after Brady's 2009 death. Interviews have included such celebrities as Steve Carell, Jimmy Fallon, Katharine McPhee, Katy Perry and Noah Wyle. "Numbrix": Also by Marilyn vos Savant, Numbrix is a simple puzzle game in which the reader arranges the numbers 1 to 81 in a continuous path that fits into a 9×9 square grid. Numbrix was introduced in July 2008 (originally as a 7×7 puzzle). In addition to the weekly print version, vos Savant also produces daily Numbrix puzzles for Parade's Web site. Since 2014, Parade's site has also published a much more difficult variant, "Jadium" (formerly "Snakepit"), by Jeff Marchant. "Our Towns" is a regular feature written by journalists from Parade newspaper partners. "The Parade High School All-America Teams": This sports franchise honors as All-Americans the best U.S. high school athletes in boys and girls basketball, football, and boys and girls soccer. Parade began its series in 1957 with its boys basketball honors, and expanded to football six years later. Girls basketball was added in 1977, boys soccer in 1979, and girls soccer in 1993. In 2010, Parade introduced its All-America Service Team, which honors high-school students for commitment to service and volunteerism. "Walter Scott's Personality Parade" by Walter Scott (a pseudonym, originally used by Lloyd Shearer and now by a rotating group of edit staffers): In Q&A sessions, celebrities often discuss some project or movie which is just about to be released. "Views," an editorial column by various authors, including CNN political analyst David Gergen and Pulitzer Prize–winning journalist Connie Schultz. "Fresh Voices": A former column where teenage readers would give their opinions on a different topic. Daria, from the MTV series of the same name, would frequently appear among them, giving a sarcastic opinion. The magazine has a lag time to publication of about ten days, which has caused the magazine to print statements that were out-of-date by the time Parade was publicly available in a weekend newspaper. "Dear Parade Readers, Parade publishes more than 32 million copies of each issue and distributes them to 415 newspapers across the country. In order to meet our printing, distribution and insertion deadlines, we must send the issue to the printer three weeks before the cover date. 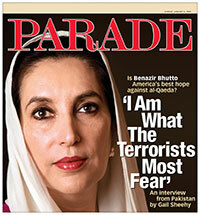 Our Benazir Bhutto issue, for example, went to press on Dec. 19. By the time Ms. Bhutto was slain on Dec. 27, this issue of Parade was already printed and shipped to our partner newspapers. Recalling, reprinting and redistributing our January 6 issue was not an option." A similar incident occurred in the February 11, 2007 issue when Walter Scott's "Personality Parade" reported that Barbaro, an American thoroughbred racehorse and winner of the 2006 Kentucky Derby, was in a stable condition. Barbaro was euthanized thirteen days earlier, on January 29, 2007. On April 27, 2014, Walter Scott's "Personality Parade" reported that Joby Ogwyn would BASE jump in a wingsuit from the summit of Mount Everest live on the Discovery Channel in May 2014. However, before the edition appeared in print, the government of Nepal closed Mount Everest to climbers because of an avalanche on April 18, 2014 that killed 16 Sherpas, including five Sherpas working for the Discovery Channel in advance of Ogwyn's planned jump, hastening the cancellation of the special. ^ "Athlon Names New 'Parade' Editor". Nashville Post. Jan 9, 2015. Retrieved 8 June 2015. ^ Ping Shaw (1999). "Internationalization of the women's magazine industry in Taiwan context, process and influence". Asian Journal of Communication. 9 (2): 17–38. doi:10.1080/01292989909359623. ^ Clodfelter, Tim (March 15, 2016). "SAM". Winston-Salem Journal. Retrieved April 7, 2016. ^ Huff, Doug. "EA SPORTS Boys & Girls All-Americans". yahoo.com. Archived from the original on March 15, 2015. ^ "Felder signs with Lady Bulldogs". Athens Banner-Herald. April 13, 2000. Archived from the original on March 15, 2015. ^ Cohen, Haskell (January 14, 1979). "Parade's First All-America High School Soccer Team". Parade. p. 20. Retrieved March 15, 2015. ^ "Named to the PARADE All-American team". milton.edu. June 2003. Archived from the original on May 28, 2010. ^ Woo, Elaine (2001-05-26). "Lloyd Shearer; Leader of the 'Personality Parade'". Los Angeles Times. Retrieved 4 February 2014. ^ Leventis, Angie. "Featured Articles From The Chicago Tribune". Archives.chicagotribune.com. Retrieved 2013-10-13. ^ "'Parade' Interview Fails to Note Bhutto's Death". NPR. 2008-01-06. Retrieved 2013-10-13.